This productive year has seen publication in EMLO of thirty-one new correspondence catalogues, significant enhancements to an existing dozen (either with new letters, further detailed metadata, or transcriptions added), and the blossoming of a number of ground-breaking initiatives, including of course the pioneering and rapidly taken up Bodleian Student Editions. Summer was heralded this year with the official launch in Oxford of Women’s Early Modern Letters Online [WEMLO], the invaluable resource and networking hub for scholars of women’s correspondence, and we were truly thrilled that this was followed by a spectacular autumn launch at the Royal Palace in Amsterdam of the correspondences of the wives of the seventeenth-century Dutch Stadtholders, compiled by Dr Ineke Huysman. And now, in these dwindling December days, EMLO sees out this year with the correspondence of one of the sixteenth-century’s most remarkable figures, Bess of Hardwick. Bess was an indomitable woman. Widely known for four fortuitous marriages, each layering status and wealth onto the foundations of the previous, her life played out against a backdrop of England’s religious troubles under a succession of Tudor monarchs (Henry VII, Edward, Mary, and Elizabeth) until, by the time she died at the age of about 87, the first Stuart king James VI and I was well into his reign over a combined Scotland and England. This longevity enabled Bess to plan and to build in a number of ways. She weathered her childbearing years to emerge as a matriarch and a builder of dynasties. With her second husband, the twice-widowed treasurer of the king’s chamber Sir William Cavendish, she bore eight children, six of whom survived to adulthood. In addition, Bess presided over a dizzying number of step-children as well as her grand- and step-grandchildren (I’m not going to attempt to count them but, rather, leave this figure open as a new year’s quiz; answers by email only, please!). Marriages were orchestrated carefully, even between her own children and her step-children, and from 1582 she was responsible for raising her granddaughter, Arbella Stuart (1575–1615), a claimant — as the child of Bess’s own daughter, Elizabeth Cavendish, and Charles Stuart — to both the English and the Scottish crowns in the years when the aging Queen Elizabeth refused to name a successor. It may have been a wise decision that, as a begetter of heirs, Bess kept herself largely to her home county of Derbyshire, despite being entreated by none less than the lord treasurer himself, William Cecil, Lord Burghley, not to ‘not live so solitary as it seems you do there in Chatsworth amongst hills and rocks of stones’. It was some two decades later, however, in 1587, following an acrimonious legal battle over estates with her fourth husband, George Talbot (sixth earl of Shrewsbury, and keeper between 1568 and 1584 of Mary, Queen of Scots), that Bess embarked upon her most creative enterprises. In 1583, in the name of her son William, she had purchased the Hardwick lands following the death of her brother James, who had ended his days a bankrupt two years previously in Fleet Prison leaving just one — illegitimate — son. (The correspondence contains a letter from James to Bess asking for money, as well as another from their mother writing on his behalf with the same request.) Within just eight years, the house known today as ‘Hardwick Old Hall’ was complete, and by 1599 the monumental ‘Hardwick New Hall’, one of the most architecturally ambitious and audacious undertakings of the age, was in place. This house, for which even the rigorous Pevsner rolls out the rhyme ‘Hardwick Hall, more window than wall’, is topped with stone-carved crowns and Bess’s own monogram ‘ES’ [Elizabeth Shrewsbury]. Bess’s correspondence charts these remarkable creations as well as her own extraordinary story and it affords us detailed glimpses into her world of building and family management as she navigated the complexities of the times in which she lived, exchanging letters with royalty and figures of state, with family, friends, and servants alike. Her letters — currently 234 in total — have been edited and published together with full transcripts, commentaries, and images of many of the manuscripts by the AHRC-funded project Bess of Hardwick’s Letters: The Complete Correspondence (University of Glasgow), under the direction of Dr Alison Wiggins, and each record in the EMLO catalogue links straight through to this project’s full entry. We hope you will take advantage of the midwinter break to explore Bess’s correspondence, and to set it against those of her contemporaries in EMLO, both male and female. 2016 will long be remembered by us as the year in which WEMLO was launched, and with 12,285 letter records currently in the union catalogue from, to, or mentioning women, we look forward greatly to the quantity of women’s correspondence increasing apace over the year ahead. To echo the words of our colleague Dr Kim McLean-Fiander, co-director with Professor James Daybell of WEMLO, a gender search is something that should be built into all digital correspondence editions and library catalogues, for both women and men need to be searchable by gender as well as across the combined whole. Whatever your search and whichever correspondence you intend to consult, we hope you find this gender-search functionality in W/EMLO useful, and we wish you a very happy New Year! This entry was posted in Uncategorized on December 30, 2016 by Miranda Lewis. As an offering in this week of the solstice, EMLO has released metadata for a selection of Martin Opitz’s correspondence. One of the founding fathers of German literature, Opitz is a poet with words for those in the throes of a dark and troubled northern midwinter. Could this be the moment to read his Trost-Gedichte in Widerwertigkeit deß Krieges [Poems of consolation at the resumption of war] of 1633, or, in the stillness of a long, dark night, listen to a reading of his poem Jetzund kömpt die Nacht herbei [Now the night comes], or to a recital of it set to music by Johann Nauwach (1595–1630) and sung by the incomparable Andreas Scholl. Opitz was caught up in the horror of the Thirty Years’ War. Born in Bunzlau [now Bolesławiec, in Poland], he was one of the many scholars who traversed the face of Europe through these war-torn decades, studying in Frankfurt an der Oder, in Heidelberg, and in Leiden. From his letters, we are able to follow him to Breslau [Wrocław] in 1626; Prague in 1628; Breslau again in 1628–9; and Paris in 1630, where he met Grotius and members of the Dupuy circle. 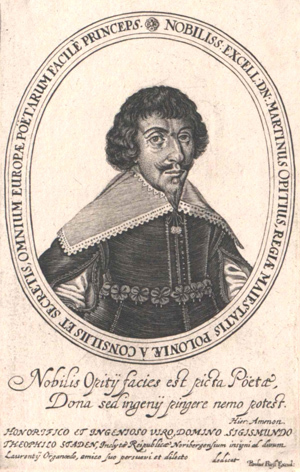 Opitz ended his days in Danzig [now Gdańsk], dying there of plague in 1639, nine years before the Peace of Westphalia brought to an end this episode of Europe’s misery. Opitz was a witness to troubled times. This entry was posted in Uncategorized on December 21, 2016 by Miranda Lewis. If you follow the blogs and tweets that emanate from the Bodleian Libraries you may have noticed EMLO is involved in an initiative called Bodleian Student Editions, an exciting new scheme set up to explore the potential of the Bodleian’s resources for cross-disciplinary training, and, at the end of a busy but productive term, I’d like to draw your attention to something extremely special that has just become available as a result of this inspiring collaboration. A ‘thing of beauty’, no less. 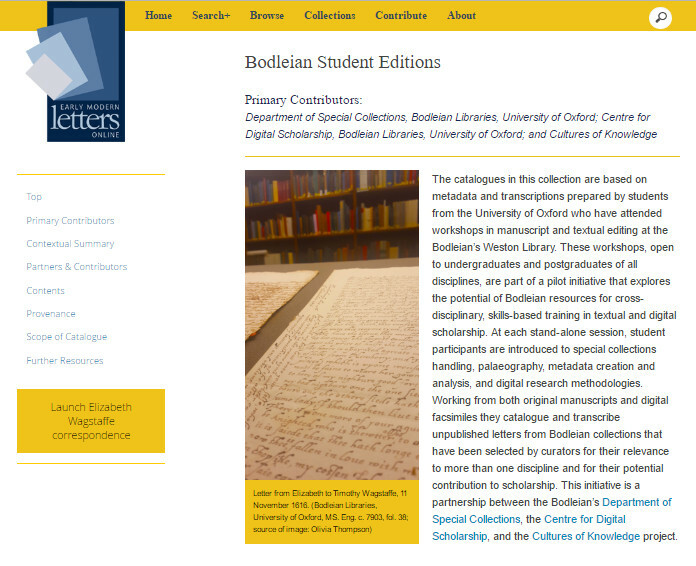 A collaboration between curatorial staff from the Bodleian Libraries’ Special Collections department, the Centre for Digital Scholarship, students at the University of Oxford, and our own Early Modern Letters Online, Bodleian Student Editions took root early in 2016 when a number of us met at a conference — Digital Editing Now — in Cambridge (and I shall be eternally grateful to our own Faculty of History for the generous sponsorship that enabled me to hop on the X5 bus, spin round the roundabouts between the two universities, and attend). A subsequent series of fruitful conversations, an altruistic willingness for genuine collaboration, a truly excellent student-led conference here in Oxford last June (Speaking in Absence: Letters in the Digital Age), and a remarkably lucid vision shared by the partner participants have combined to nurture Bodleian Student Editions from a glimmer in the collective eye to six pilot workshops scheduled across this current academic year. Each standalone session offers twelve students (from any Faculty, either undergraduate or postgraduate) an introduction to the handling, reading, and transcribing of pre-selected manuscript letters from Special Collections. Students work in pairs to transcribe; they don editorial hats to check transcriptions prepared by others; they collate metadata; they conduct research into the relevant early modern people, places, and events; and they enter their work into EMLO using the catalogue’s webform. Mike Webb (the Bodleian’s Curator of Early Modern Manuscripts), Pip Willcox (Head of the Centre for Digital Scholarship), and I (as EMLO’s editor) lead the sessions, offering advice on the range of issues that should be considered, and the decisions made, when working with manuscripts in a digital environment, and guidance is provided concerning subsequent training in XML/TEI and the use of visualization tools. The six letters selected for the inaugural session were written from Elizabeth Wagstaffe (neé Fuller) to her husband Timothy Wagstaffe, a lawyer at Middle Temple. Elizabeth was a daughter of Nicholas Fuller, the puritan lawyer and MP, whose family home was at Chamberhouse, near Thatcham, in Berkshire. Elizabeth married Timothy, the son of Thomas Wagstaffe of Harbury, Warwickshire, on 2 January 1604/5. Timothy, who matriculated to Oriel College, Oxford, was admitted to Middle Temple on 12 May 1597. He purchased the manors of Tachbrook Mallory and Bishop’s Tachbrook, near Warwick, and these Bodleian letters provide a fascinating glimpse into the running of the couple’s busy household. Five of the letters were sent by Elizabeth from Warwick, and include snippets of news concerning many of the local gentry. (There is mention, for example, of Sir Bartholomew Hales, J.P., of Snittersfield, the village in which Shakespeare’s grandfather was a tenant farmer and where the bard’s father, John Shakespeare, was born.) The earliest letter is written in 1616 from Fuller’s house in Berkshire, where two of Elizabeth’s sons had been born and baptised in 1615 and 1616, and recounts the preparations for a ‘agrate meetinge, att Margetts mariage [possibly that of Edward Folwell and Margaret Fowell on 20 November 1616] (of folke from Newbery, and Thatcham)’. As our Michaelmas term draws to a close, I’m delighted to announce tangible results of this initiative with the first cluster of letter records published in EMLO under the aegis of Bodleian Student Editions and, of course, the promised ‘thing of beauty’: a set of gorgeous images of the manuscript letters themselves. It is here, and not for the first time, that thanks are due many times over to Bodleian Student Editions’ wonderful and inspiring Olivia Thompson (Balliol-Bodley Scholar and DPhil candidate in Ancient History) and Helen Brown (DPhil candidate in English), and to the Balliol Interdisciplinary Institute, which generously covered imaging costs for these letters, and I hope everyone who clicks through from the records in EMLO will agree that Digital.Bodleian could not be a more perfect platform for their display. The metadata and transcriptions created during the second Bodleian Student Edition workshop, which was held just over a week ago, will be added to the EMLO catalogue early in the new year. The scheduled sessions have been so heavily over subscribed that a waiting list is now in operation, and we’re truly delighted so many students are keen to participate. It seems the future of scholarly editions gleams bright, and we hope, as you pore over these letters of Elizabeth Wagstaffe, you’ll hear her voice loud and clear and will find in EMLO and Digital.Bodleian treasures that can remain ‘a joy for ever’. This entry was posted in Uncategorized on December 12, 2016 by Miranda Lewis.